"HEARING IS BELIEVING," the new non-fiction feature from award-winning filmmaker Lorenzo DeStefano, introduces the world to the astonishing young musician and composer, Rachel Flowers. Born 15 weeks premature, Rachel soon lost her eyesight. At two she began playing every song she heard by ear, including Bach fugues. Starting her musical education at the age of 4, it was soon clear that the child had perfect pitch. DeStefano and his team have created a dynamic and engaging portrait of two years in the life of a tight- knit American family, a single mom and her two kids, living paycheck to paycheck in Oxnard, California, with Rachel's stunning music as the soundtrack. The film revels in Rachel's joyous and free-flowing love of song, illuminating the bonds of family and the divine mysteries of creativity. 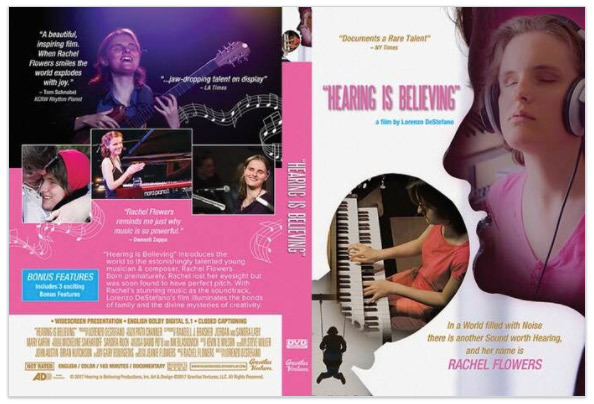 "HEARING IS BELIEVING" is produced & directed by Lorenzo DeStefano. Executive producer is Patti Channer. Co-producers are Randell J. Brasher, Sandra Laby, Jordan Laby, and Mary Karrh. Editing by Kevin D. Wilson. Cinematography by David Pu'u and Nik Blaskovich. Music by Rachel Flowers.